I tried many different study methods, some more effective than others. Some worked well for certain classes and not for others, so I had to adjust for each class and each professor. Hopefully this isn’t too overwhelming, and I promise that you don’t have to do all of this to do well in PT school. Some classmates just took notes and read their notes later, and did just as well. These are ideas that I tested out, and most worked well for me. They’re also not in any particular order. Yeah, it’s pretty obvious. Some classes had powerpoints, so you didn’t need to take extra notes. Some powerpoints had a little information so you had to write a lot on the side. Some lectures were hard to stay awake in, so being active and typing or writing can help you focus. Sometimes it was also good to not take too many notes during class and listen to the professor. I took most of my notes with the Staedtler pens. It kept me organized, and was useful for drawing and labeling information. I used the other pens occasionally. 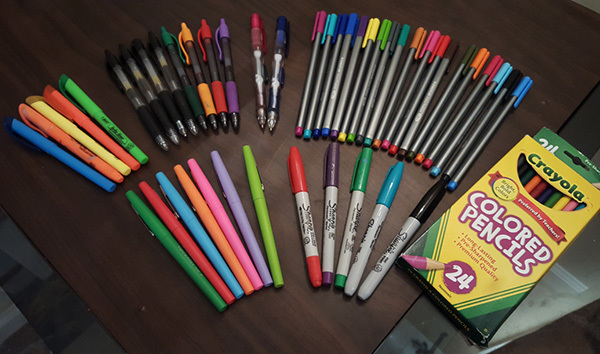 Here are links to buy the pens/pencils. You can find some of them cheaper elsewhere. Our anatomy professor records her lectures and powerpoints, so I rewatched 100% of them. It took a long time, but that way I could focus more on listening to her during class, because I knew I could write down any specific information later. I draw as much as I can. I love drawing so it makes studying really interesting. Drawing directly into your notes is helpful so you don’t have to look up a picture when you’re studying. It was beneficial for me because often I wouldn’t get a great grasp on information until I had drawn it out and color-coded everything. Drawing also helps you organize your notes better, especially if there is a lot of information in more than one location. Sometimes it takes 10 powerpoint slides to explain a process, so I tried to put everything on one paper so it made sense to me. If you’re not that great at drawing, that’s fine! As long as the photo makes sense to you, that’s all that matters. 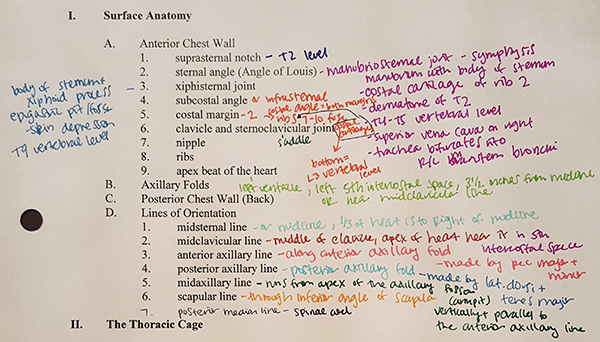 I also printed out lots of photos if I knew that I could not draw them well enough (like vertebrae or nerves), and then wrote extra information next to the diagrams. 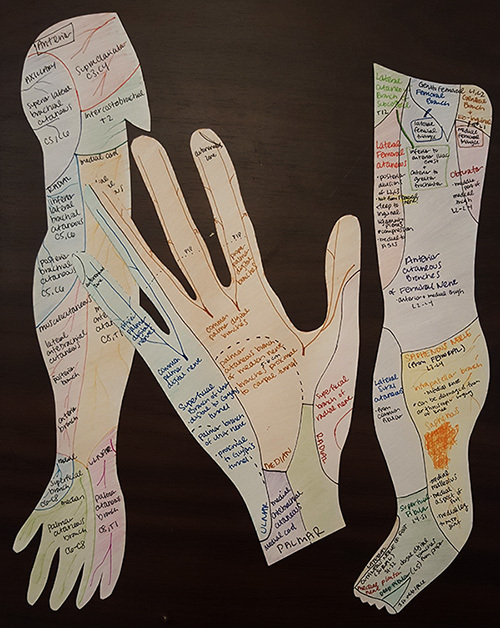 This was really useful for dermatome maps. Textbooks show both sides of the body, but I liked having the ability to flip over the paper and see how each side is connected. You can also do something similar for muscles and bony landmarks. We read a handful of articles for our patient care class, so I highlighted as I read through the article and then typed up an outline from the highlighted parts. That way when I was studying for the exam, I just had to read my outline instead of the article. I studied by picking a topic, section of notes, or powerpoint slide and quizzed myself. I wrote down as much information as I could remember, and then double checked with my notes and filled in any information that I left out. I really liked drawing on white boards for this purpose. 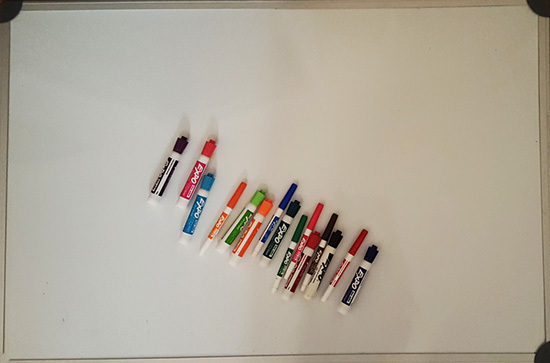 Whiteboards are fun for me, so I enjoyed using mine. I printed out some skeletons and drew muscles on top to quiz myself. This was really helpful with the back muscles because I could never remember them. I already had a package of sheet protectors that I used for my lab binder, so hopefully you already have some. You can also use the front or back of a binder if you have a clear pocket there. Similarly to the sheet protectors, you can mold muscles from the clay and place them on top of the skeleton photos. They don’t stick very well, but it works well enough. This was really helpful for the back muscles too, because there are so many confusing layers. The clay helped me visualize how muscles were related to each other, because sometimes it’s difficult to understand that from photos. I bought mine from Walmart. KhanAcademy was so helpful for physiology. Whenever classmates found good videos, they would be posted to the Facebook group. KhanAcademy tends to be more geared for undergraduate-level courses, but it’s still helpful to get a basic understanding before learning the details that you need to know. I made a Quizlet for each muscle attachment, innervation, and action. I only really studied them on my phone, because the phone app will let you learn the flashcards in smaller batches. You’ll have 8-10 flashcards per round, and the ones that you missed will be repeated the next round until you learn them. If you learn them on your laptop, you’ll have to go through all of your flashcards each round, and then the next round has all of the cards that you missed. I found that it took me a lot longer to learn that way because I would forget the information more quickly. There are several games that you can play. You can also make classes on quizlet. Several classmates really liked making quizlets, so they were all added to the same class, so all of the quizlets were in the same spot. Here’s my blog post on How to Use Flashcards Efficiently. I typed up most of the information from the book, and added information from what our professor wanted us to know. 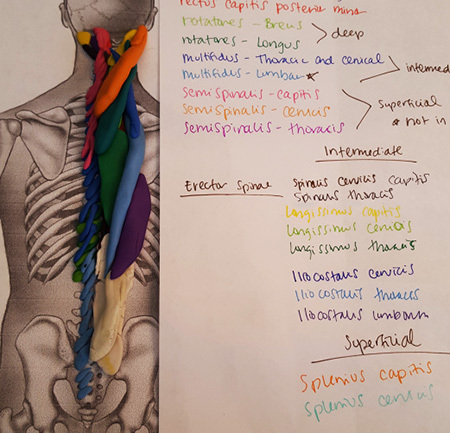 I added any other information that was relevant to each muscle, which really helped me remember the information. I made one copy for my regular binder, and another copy for my lab binder. 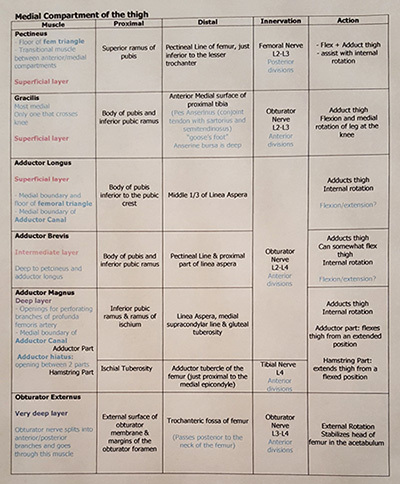 For a copy of my completed muscle charts, view My Notes. This is something that everyone struggles with. I would learn the information one day, and then not go back to it for several days or a week, and then I would forget a lot of the information by then. Going over the information every day, or every other day, would have been really helpful for a few classes. I started doing this near the end of the semester, when I was more caught up with the material. If possible, try to look over all of your new notes that same day. There have been studies that show that it’s better to go over the information as soon as possible, so that you’ll remember it a lot better. It is difficult to do this though, especially if you feel like you are already behind and need to learn last week’s material before beginning this week’s. Some days I worked just fine in my room. 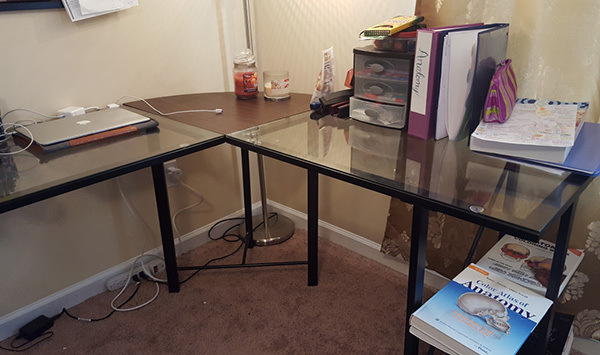 My L-shaped desk was a life-saver, so I could have a heavy textbook open on one side and have my laptop and notes open on the other. I had a ton of space to do my work, which was really helpful. When I had trouble focusing, I had to go to the library and be around other people. I feel guilty for watching Netflix in the library, so I don’t waste nearly as much time in the library. I also had some luck studying at a coffeeshop. I studied with other people before every exam for our patient care class, and it was so helpful to speak out loud and quiz each other. Try to stick to smaller groups of 2-4, just so it’s easier to stay on topic and so everyone has a chance to answer a question first. One class had a lot of different types of notes. We had powerpoints, articles, handouts, textbook outlines, and lecture notes, so it was really easy to feel overwhelmed and disorganized. I typed as much information as I could into one giant study guide and studied that. When it’s hard to focus, sometimes music can make you feel more energized and ready to work. However, sometimes I pick music that I love to sing along to and study even less than I was before I turned the music on. Pandora and Spotify both have great studying stations. Some classmates also like 8tracks. 20. Most importantly, take breaks! I definitely took tons of breaks. There were some weekends that I didn’t pick up a book, and some weekends that I never put down my books. However, I always did something fun every day. I watched a Netflix episode (or 3) with dinner, took 10 minutes to do some yoga, or checked the facebook group to see how many classmates also weren’t studying. Do you have any study tips to share? Please comment below! NEURO!!!! I am struggling! Any tips? 🙂 Thank you so much for this post. It has helped me tremendously! Hey Brittany! Thank you so much for reading and leaving a comment! I really appreciate it 🙂 I’m so glad that this post has helped you so far! Is there anything specific about neuro that you struggle with? I might be able to give better advice if there are any topics that are especially challenging for you. 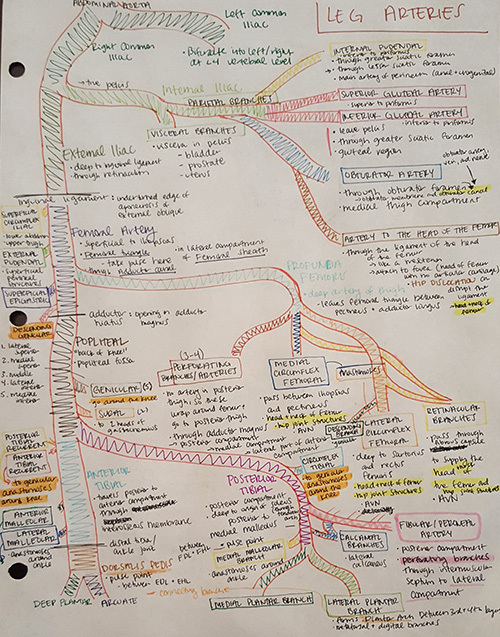 Neuro was easily the most time consuming and confusing class for me, and I really had to mess around with different studying tactics until I found something that works for me. That being said, take the following advice with a grain of salt, because what worked for me might not work for you. 1. If your professor posts lecture notes / slides before class, read through them and try to understand them BEFORE lecture. I know it’s really challenging to even keep up with studying, but I found that to be the most helpful for me. When I was lost during lecture, I had so much trouble paying attention because I would get frustrated. I find that if I showed up to lecture just knowing the gist of what we were going to talk about that day, I would understand and retain a lot more of the information. 3. Watch videos on Youtube or Khan Academy. Just know that sometimes the videos are not detailed enough, and sometimes the information may be a little different than what your professor wants you to know. 4. Study with other people. I’m the type of person that needs to study alone for the first 80%, and then when I have a solid understanding, I study with other people to make sure I really understand all the material. Best of luck with neuro! You’re gonna be just fine! Let me know if you can’t find any good online resources for specific questions and I’ll do my best to help! You’re welcome! 🙂 I really hope this helps. 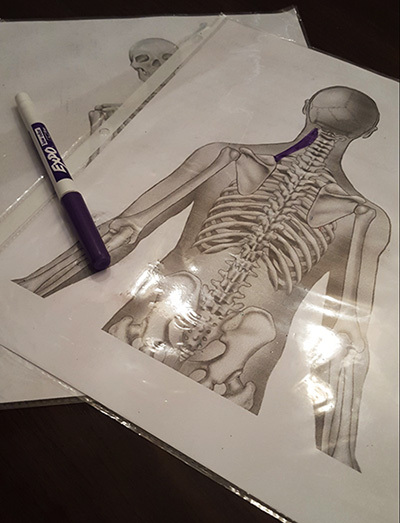 The spinal tracts tend to smack everyone in the face when you first try to learn them, but I promise that they DO get easier! The best 2 things I did for the tracts were to draw 1 master copy of each tract on a separate sheet of paper, and then I practiced re-drawing from memory until I understood how it worked. I also tried to apply it to patient care a bit – so for example, if a patient you’re seeing can’t feel light touch on their left leg, which spinal tract might be causing that? Try to come up with a few questions, and then see if you can answer them without looking at your notes. I wish I had known you in PT school! I am a visual and hands-on learner like you! I could have really used these tips. I didn’t have time to eat lunch while I was in school, much less run a quality blog like this. I think you have a gift for teaching. It will be neat to see where it takes you. Have you seen the artist Rey Bustos and his explanations of anatomy? He teaches artists, but I can’t get enough of his drawings and artistic descriptions of bones and muscles. There are a few videos online. He has a live class called ecorche for the artists in L.A. where they learn to make small wire forms and then attach the muscles (made of clay). 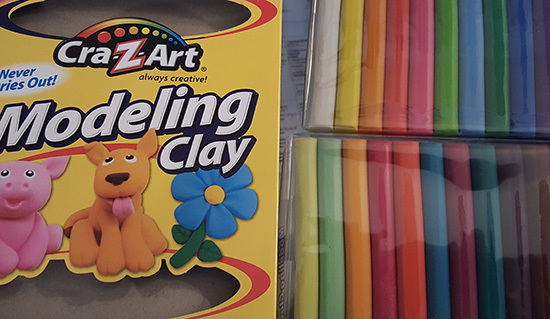 Reminds me of your clay muscles on the plastic overlays.. (Very clever, by the way!). I’m so sorry for taking months to reply! I had my notifications turned off and just saw your comment this morning! Haha most people don’t have much spare time in PT school (myself included), as you can see by my lack of updates this year. Thank you so much for reading, and the sweet comments! It really does mean a lot to me! I have not heard of Rey, but I’ll definitely look him up later today! I felt the same way about Netter’s drawings, and I always find myself distracted by how beautiful the paintings are, which definitely takes longer to actually study for my classes. If I’m ever in LA then I’ll have to check his live class out! Wow! Great to hear from you. What a nice reply! Funny thing, Rey Bustos now has his ecorche class online through an artists’ site called “New Masters Academy”. Turns out the site charges something around $37 a month, no commitment necessary, to view their artist courses. 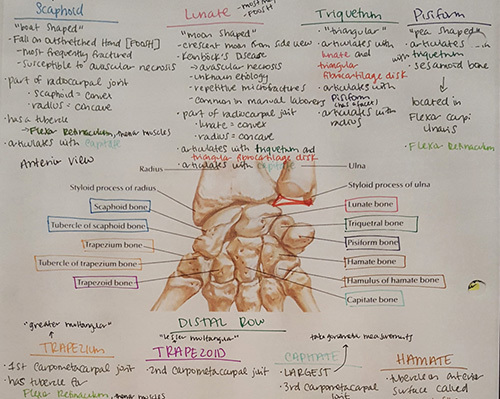 If you go to the site and browse by instructor for his name, you can see a thumbnail view of his ecorche classes and chalkboard anatomy classes and you will see what I am talking about. I suggested that my husband give me a one month subscription for my birthday so I can finally take the class and watch his anatomy lessons. It has been so neat. I might have to get one more month, just to view all of his lessons. Warning, though, the anatomy lesson occasionally has “undraped” models pop up to show the surface anatomy he is showing on the chalkboard (those artists always like a live model, you know). Anyway, I figured out where the image usually pops up and was able to put an index card over it so that none of my kiddos are exposed to any surprises if they happen to be standing behind me at the computer! Other than that, he is really fun to listen to and has a deep love for teaching anatomy. I have a question where do you get those cut outs? Thanks for reading and leaving this comment! I’m glad I was able to help! I made the cutouts myself from cardstock/scrapbooking paper, since it’s thicker than regular computer paper. I traced my hand and drew the arm and the leg, and then cut out the shapes with scissors. 🙂 I would recommend making the arm and leg as wide as you can, since I ran out of room when I wrote on it. That’s also why I have an arm and a separate hand – I originally made the hand too small, so I made a bigger hand that I could write on. Best of luck on your PT journey! Thanks for reading! I’m glad you found some helpful tips! As for blogging, just make sure you’re super careful with what you write online, because patients, faculty, and employers can read everything you post. Make sure that you’re following HIPAA, and you can be extra careful by excluding the name of the facility or age of the patients that you see. Make sure that you proofread everything because there are probably a few errors in every post you write. Don’t talk about exams in too much detail if your readers are going to know what program you’re attending. I get the most views on posts that have lots of advice like study, gre, and interview tips. Yeah, it seems like your blog is somewhat private right now, but I definitely have to be careful since I have my photo and school on here. If you have any other questions, feel free to send me an email!